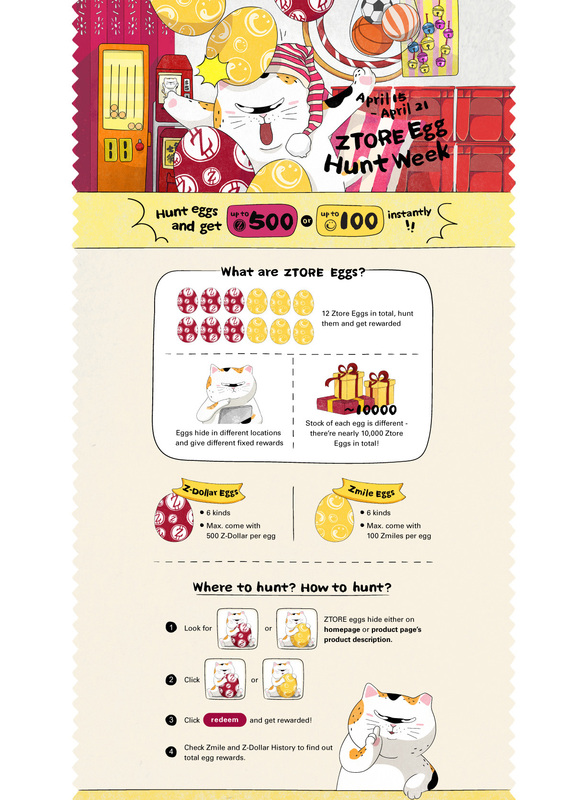 Ztore Egg Hunt Week campaign period starts from 15 April, 2019 to 21 April, 2019. Ztore customers are eligible to participate and must log in before redeeming rewards. A total of 12 sets of Ztore Eggs are placed in different but fixed locations on Ztore website. Each Ztore Egg comes with a fixed amount of Z-Dollar or Zmile reward. The amount of each set of Ztore Egg is different and is available for redemption while stock lasts. First come, first served. All Z-Dollar and Zmiles will be added to user's account automatically once user confirms redemption. User can check out "Zmile and Z-Dollar History" to find out the total amount of Zmiles and Z-Dollar redeemed during campaign. Each user can redeem at most 1 reward per set of Ztore Egg. "Z-Dollar" is valid for 12 months from the last purchase date of account, or 12 months from registered date for accounts without purchase. The use of Z-Dollar is limited by its regular terms and conditions, available at FAQ. Zmile will expire 120 days after earning. The use of Zmile is limited by its regular terms and conditions, available at Zmile Club FAQ. Ztore employees and their family members cannot participate in this campaign. Should any dispute arise, the decision of Ztore HK Limited shall be final.